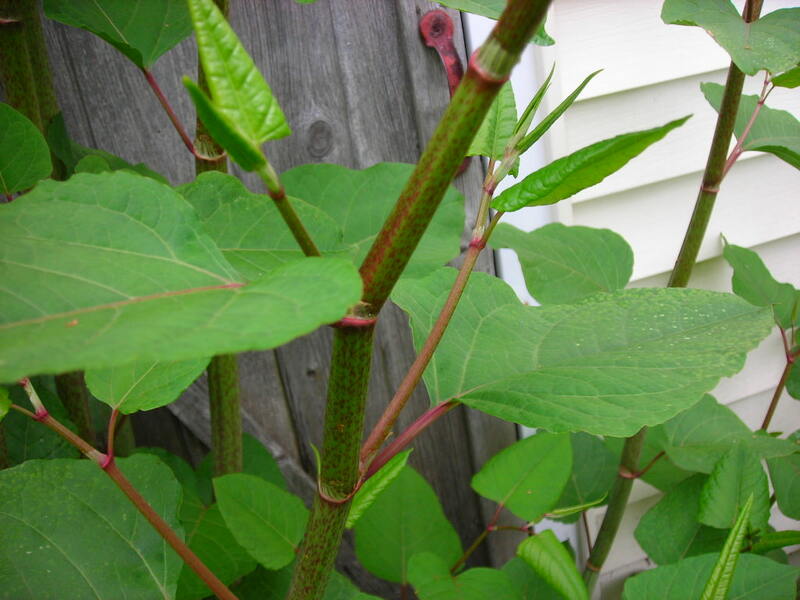 There have been a number of calls(1,2,3,4) in recent weeks and months to control the invasive plant Japanese Knotweed, at least partially, by eating it. In recent days, Kerry County Council in Ireland heard from one member who, albeit with tongue-in-cheek, urged citizens to make wine, jelly and other sweet treats from the plant. This strikes me as a terrible idea. The plant itself is certainly edible - the Japanese have been eating it for years. It's Japanese name, itadori, means 'well being' and it seems to have some medicinal properties. It also tastes a bit like rhubarb apparently. I wouldn't know, I haven't tried it. I haven't tried it for the same reason I don't advise you try it. Encouraging people to harvest and transport a regulated, invasive species is the perfect recipe (if you'll pardon the pun) for its continued and accelerated spread. 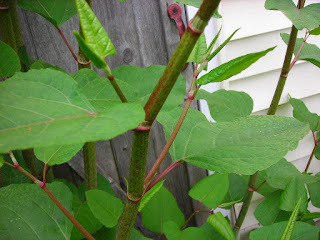 Japanese Knotweed (Fallopia japonica) is, as you will have guessed, native to Japan and the neighbouring region. It was introduced to the UK in the mid-19th century and quickly spread to Ireland and other parts of the world. Introduced as an ornamental plant, it quickly became a real problem. The plant is capable of growing at a tremendous rate - 1 metre in a month- and forms big stands 2-3 metres in height. The early shoots are spear like, similar to asparagus in appearance and the plants produce delicate white flowers in late Summer. The real problem is underground where the plant forms tough rhizomes, adapted root-like organs, which remain in the soil even during the Winter when the rest of the plant dies back. Japanese Knotweed thrives on disturbance and it is mainly spread by fragments of rhizome, crown or stem being accidentally or deliberately moved. This leads to some real (and expensive) problems including a massive reduction in biodiversity under the alien canopy; structural damage to buildings and infrastructure; and the significant cost of its removal. Data from 2010 suggest that the plant costs the UK £165 million a year to control. If the plant were to be eradicated in the UK by current methods it would cost £1.56 billion. For one site alone, the 2012 London Olympic site, it cost £88 million to deal with this one invasive plant. Nobody wants Japanese Knotweed on their land. Imagine you go to the supermarket and buy a bunch of rhubarb. The first thing you do is chop the top and bottom off the stalks and chuck them on your compost heap. Do this with Japanese Knotweed and you end up costing yourself (and potentially your neighbours) thousands in a cleanup bill. Harvesting Japanese Knotweed from the wild, no matter how careful you are, is also fraught with problems. The plant can easily regrow from small fragments the size of your fingernail. If we're lucky, you'll drop these fragments at the original, infested site. If not, you'll drop them on your walk back to the car or in your front garden when you unload the car. Simply put, encouraging people to mess around with an invasive species like Japanese Knotweed is, in my view, irresponsible. It may also be illegal. In Ireland, it is an offence to "plant, disperse or cause to disperse or otherwise cause to grow" the plant. It is also an offence if "he/she has in his/her possession for sale or for breeding/reproduction/transport....anything from which the plant can be reproduced or propagated". In the meantime, there are chemical and physical control options and scientists in the UK are developing a biological control approach using a sap-sucking insect called Aphalara itadori. This is an old enemy of the plant, found in Japan and currently being tested in the UK to see if it will do the same job in this part of the world (and not eat anything else, by accident). The trials haven't been a total success with numbers surviving over winter too low to have much of an effect, but the tests are ongoing. Hopefully, before too long we will have a sustainable control option for this invasive plant. In the meantime, stop eating it. Recent reports that Irish people are wasting one million tonnes of food give us, as the old idiom goes, food for thought. According to some reports, this translates into 2 billion meals and around€1 billion worth of food. At a time when some of our citizens struggle to put food on their table, this is a worrying statistic. The figures also represent bad news for our environment and indicate a food production system under pressure. 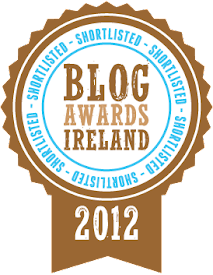 Ireland is not alone in our wastage of food. A 2013 UK study suggested that, worldwide, between 30 and 50% of all food produced never reaches a human mouth. That amounts to about 1.3 billion tonnes of food wasted every year on the planet, with losses in developing countries mostly down to inefficient growing and harvesting. In developed countries, like Ireland, consumer waste is a huge issue. Put in monetary terms, $1 trillion worth of food is wasted every year, according to the UN Food and Agriculture Organisation. Up to 30% of the UK and Ireland’s vegetable crops are never harvested due to changing, and some might argue, unreasonable demands from the big supermarkets. This is very slowly changing. Under pressure from consumers and activists, some supermarkets have introduced ranges of fruit and vegetables which are perfectly edible but aren’t the perfect shape or size that is normally demanded. These “ugly” or “wonky” fruit and vegetables are a step in the right direction but represent just a drop in the ocean compared to the amount of produce that is destroyed each year because it doesn’t meet retail guidelines. So, think about that loaf of bread that you forgot about in the back of the cupboard and had to put in the bin after a few weeks. The first thing you should reflect on is that you really should clean your cupboards out more often. After that, it’s worth remembering that it’s not only the loaf of bread you’re putting in the bin. You’re also wasting all of the energy, water and other resources which went in to producing that loaf. From start to finish, from field to bakery to supermarket shelf, a 1kg loaf of bread takes about 1,600 litres of water to produce. Agriculture is thirsty work. If you choose to add some roast beef to your bread it gets even worse: 1kg of beef takes 15,000 litres of water to produce. And that’s just one resource. You’ve also got to factor in the land, energy, fertilisers and pesticides it took to produce these foodstuffs that are ending up in the bin. Food waste is unsustainable. About 9 billion people will live on this planet in 2050. According to the United Nations, we have enough food already to feed that many people if it was more fairly and less-wastefully distributed. With advances in agricultural technology, plant breeding and plant protection products, we are getting better at producing higher yields on the same amount of land. Energy is another limiting factor for food production, especially in light of obligations to curb climate change. For every calorie of plant-based food, it costs around 3 calories worth of energy to produce. However for every calorie of beef produced it costs 35 calories. When most of this energy comes from non-renewable resources like fossil fuels, meat (and dairy) consumption starts to look unsustainable on a global scale. At the recent COP21 meeting in Paris, it was estimated that around a quarter of all greenhouse gas emissions globally come from agriculture. So, agriculture is a cause of global climate change but it is also a victim of it. Changes in weather patterns, temperature and rainfall will increasingly dictate what kinds of crops will be grown where. Agriculture will be forced to change if it doesn’t do so voluntarily. 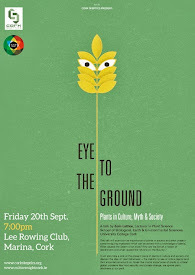 This is an opportunity for Ireland to lead global change to a more sustainable model of food production. In fairness, the issue of food waste is being taken seriously at the highest level. One of the results of the COP21 talks has been the establishment by the G20 group of countries of a Technical Platform to measure and reduce food loss and waste. Recently, the Rockefeller Foundation has pledged $130 million to help sub-Saharan African farmers to improve their harvesting, storage and food transportation systems. 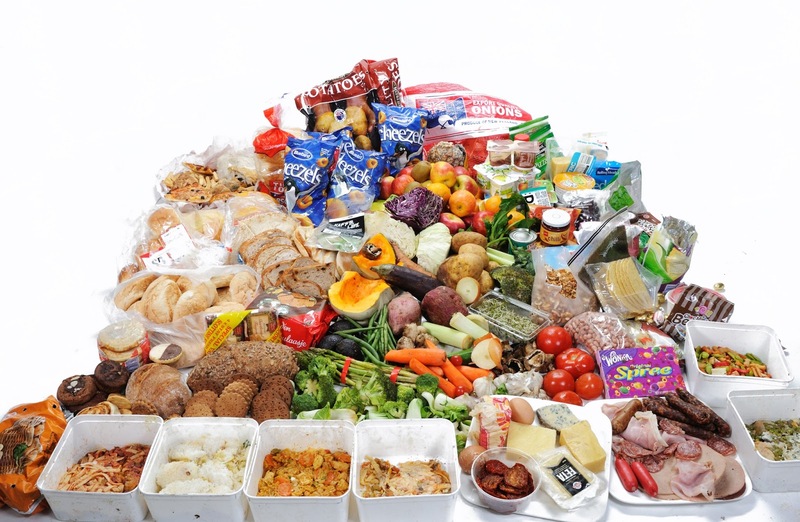 More locally, organisations like FoodCloud and the Bia Food initiative are finding innovative ways to connect companies with food at risk of becoming waste with charities who can use such food to fight hunger. Meanwhile, in Denmark a charity has just opened a supermarket stocking exclusively ‘surplus’ food. There is no doubt that for business, the issue of food waste has become an image problem and an opportunity to engage with society to develop novel solutions. If all of that doesn’t convince you to waste less food, it’s worth pointing out that the Environmental Protection Agency reckons the average Irish household throws away about €700 worth of food every year. We bin 50% of all the salad we buy. 25% of all fruit and vegetable that we buy are thrown away (with potatoes and bananas being main culprits). 20% of bread and 10% of meat and fish is also dumped in homes up and down the country. 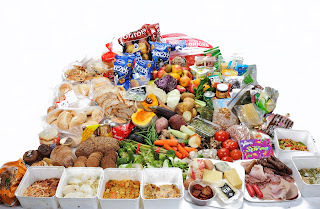 A small amount of food waste in unavoidable and food safety is an important issue. However, we all have an obligation to drastically reduce the levels of food waste if we are to develop a fairer, more sustainable society. 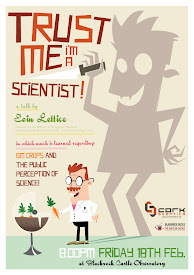 Dr Eoin Lettice is a plant scientist and lecturer at the School of Biological, Earth and Environmental Sciences at University College Cork. This article originally appeared in the Evening Echo.